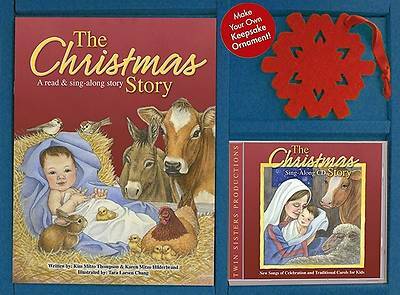 The Christmas Story boxed set includes a Read- and Sing-along Book, Music CD, and a Make-your-own Keepsake Ornament! Join Mary, Joseph, the shepherds, and the angels as they celebrate the birth of Jesus. The new recording follows the story word-for-word so pre-readers can sing and "read" along with each page on their own. Plus 15 additional carols and songs for kids! Keepsake Ornament for children to make!